Fairbanks is applying for federal funds for Title I, Title II-A, IDEA, and Early Childhood. Public input on how those funds will be expended is welcome. Biennual State Budget in process. Entering second half of our 5-Year emergency levy, planned for renewal in November 2018. This levy brings in $1,679,000 in operating revenues for the district (approximately 7 Mills). This levy is important to the operations and financial stability of the district. General Property Tax includes Residential, Agricultural, and Commercial property located in the district. General Property Tax for operations is levied at approximately 26.6 mills, with 20 mills being unvoted minimum collected by law, and voted emergency operating levy of 6.6 mills. Emergency levy brings in $1,679,000 per year for operations. This is a five-year levy that expires in 2019. There is also debt millage for the elementary outside of operations at approximately 3 mills.School funding starts with the State's premise that funding is a shared responsibility between them and the local community. The State provides some basic aid funding, but then relies on local communities to provide the remaining necessary funds. How much State aid we receive typically is a function of the number of students and property wealth per the number of students in the district. Schools would not be able to provide the services and programs without local support. 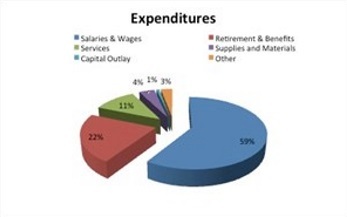 Below is a current breakdown of Fairbanks district revenues. Property tax allocation would be considered State Assistance. Income tax is .75% for operations. There is also a separate .25% income tax for permanent improvements only. Permanent Improvement levy is for 5 years with a current expiration in 2021. Permanent Improvements are tangible assets or improvements to facilities/buildings. 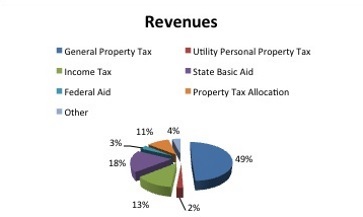 Property Tax allocation includes a 12.5% Homestead/Rollback the state pays on behalf of home owners. Since schools are service organizations, approximately 75-80% of the budget goes to personnel staffing (Salaries, Wages, Benefits). We have 118 full and part-time staff members made up of Teachers, Bus drivers, Maintenance and Custodial, Support staff, and Administration. Tuition to other schools for Special Education, Community, and Charter Schools.